Plans for Astoria Cove, a 2.2 million square foot development that would open up waterfront access in Astoria, Queens, were approved by the City Council on Tuesday. The spotlight has been on Astoria Cove as the first project to undergo the full review process under the new administration. It is a mixed-use development with more than 1,700 units, ground-floor retail, a supermarket, a school, and a ferry dock. Developers agreed to provide 27 percent affordable housing and use all union labor, which Council members say is a historic achievement. With the Council’s approval, developers can now pursue work to reclaim the long-neglected area on the waterfront. The developers—2030 Astoria Cove, a group led by Alma Realty—were the first to participate in the mandatory inclusionary zoning program. The program is part of Mayor Bill de Blasio’s housing plan (the details of which are still in the works). Under this plan, developers of residential projects will have to set aside units for affordable housing without receiving the usual subsidies. About 460 units will be permanently affordable. Five percent of the development will be available for people and families earning 60 percent of the area median income (AMI), or around $65,000 annually. Rents would start at $800 per month. Fifteen percent of the units will be available to those earning 80 percent AMI (starting at $1,200 per month), and 7 percent will be available for those earning 125 percent AMI (starting at $1,800 per month). The original plan was that 20 percent of the units would be available to people and families making 80 percent AMI. 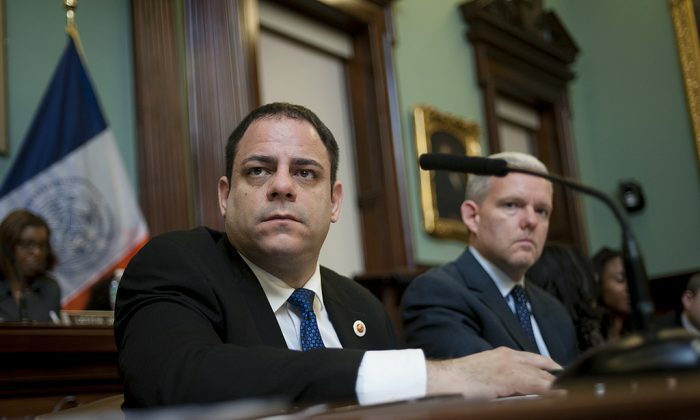 Just 2 percent of the units will receive city subsidies, said Council member Costa Constantinides, who represents the district encompassing the development site. “This agreement shows what we can achieve when the private and public sectors work together,” Constantinides said. The city is also funding the development of a ferry dock with a $5 million grant, though there is not a ferry operator committed yet. Another $1 million grant will go toward improvements to the nearby library, and $500,000 will go toward upgrading the nearby public housing senior center. “This is the model all developers should be looking at for all developments in the future” said Council member David Greenfield, chair of the land use committee.